Debt Service Coverage Ratio (DSCR) measures the ability of a company to use its operating incomeOperating IncomeOperating Income, also referred to as operating profit or Earnings Before Interest & Taxes (EBIT), is the amount of revenue left after deducting operational direct and indirect costs. Interest expense, interest income, and other non-operational revenue sources are not considered in computing operating income to repay all its debt obligations, including repayment of principal and interest on both short-term and long-term debtLong Term DebtLong Term Debt (LTD) is any amount of outstanding debt a company holds that has a maturity of 12 months or longer. It is classified as a non-current liability on the company’s balance sheet. The time to maturity for LTD can range anywhere from 12 months to 30+ years and the types of debt can include bonds, mortgages. DSCR is often used when a company has any borrowings on its balance sheetBalance SheetThe balance sheet is one of the three fundamental financial statements. These statements are key to both financial modeling and accounting. The balance sheet displays the company’s total assets, and how these assets are financed, through either debt or equity. Assets = Liabilities + Equity such as bondsBondsBonds are fixed-income securities that are issued by corporations and governments to raise capital. The issuer borrows capital from the bondholder and makes fixed payments to them at a fixed (or variable) interest rate for a specified period. What is an Indenture? An indenture is a binding contract between an issuer, loans, and lines of credit. It is also a commonly used ratio in a leveraged buyoutLeveraged Buyout (LBO)A leveraged buyout (LBO) is a transaction where a business is acquired using debt as the main source of consideration. An LBO transaction typically occur when a private equity (PE) firm borrows as much as they can from a variety of lenders (up to 70-80% of the purchase price) to achieve an internal rate return IRR >20% transaction to evaluate the debt capacity of the target company, along with other credit metrics such as total debt/EBITDADebt/EBITDA RatioNet debt to earnings before interest, taxes, depreciation, and amortization (debt/EBITDA ratio) is a measure of financial leverage and a company’s ability to pay off its debt. Essentially, the net debt to EBITDA ratio gives an indication as to how long a company would need to operate at its current level to pay off multiple, net debt/EBITDA multiple, interest coverage ratioInterest Coverage RatioInterest Coverage Ratio (ICR) is a financial ratio that is used to determine the ability of a company to pay the interest on its outstanding debt. The ICR is commonly used by lenders, creditors, and investors to determine the riskiness of lending capital to a company. The interest coverage ratio is also called “times and fixed charge coverage ratioFixed-Charge Coverage Ratio (FCCR)The Fixed-Charge Coverage Ratio (FCCR) is a measure of a company’s ability to meet fixed-charge obligations such as interest and lease expenses. The FCCR is a broader measure of the times interest coverage ratio, as it also includes other fixed costs such as leases and insurance. A higher FCCR value is preferred.. 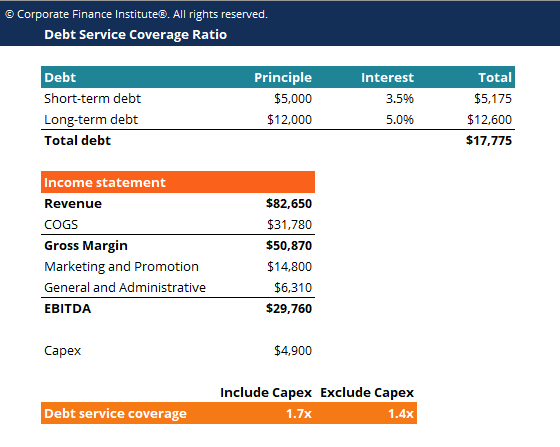 This debt service coverage ratio template built in Excel will help you calculate the debt service coverage ratio, both including and excluding capex. Some companies might prefer to use the latter formula because capital expenditure is not expensed on the income statementIncome StatementThe Income Statement (or Statement of Profit and Loss) shows performance from operations of a business. The financial statement begins with revenues and but rather considered as an “investment”. Excluding Capex from EBITDA will give the company the actual amount of operating income available for debt repayment.